So, for my 14th birthday I was planning on waiting until May (my birthday is in March) and having a pool party, as always. But as I looked on the calender to see if my birthday was on a weekend, I noticed it was on Mardi Gras day (Fat Tuesday). I live in Louisiana so we celebrate Mardi Gras here. Then I started thinking I could do a Mardi Gras themed party. 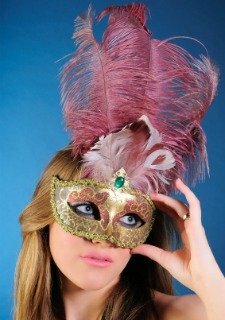 My cousin suggested a masquerade ball and I thought it was BRILLIANT. There is an old plantation home a few minutes from my house that was recently remodeled into a Victorian Venue. It was the perfect location for my Masquerade Ball. We booked the ballroom and had it decorated with purple and silver decorations. My family isn't rich so the venue alone was pretty expensive, so we hand-made all of the invitations and my mask. We went to Goodwill and found this amazing purple floor length gown for like $5. We served finger sandwiches and simple foods that were easy to prepare. Everyone came dressed in formal wear and masks. It was a dream come true and by far one of the most memorable parties ever!